By early Wednesday, users inside China encountered: "Network Timeout"
BEIJING, China (CNN) -- China has blocked the popular video-sharing Web site YouTube but did not offer a reason for the ban. 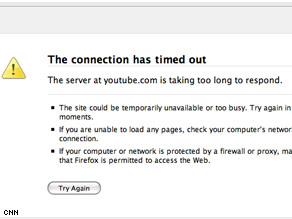 YouTube was blocked in China as of Wednesday. Google, which owns YouTube, said it began noticing a decline in traffic from China about noon Monday. By early Wednesday, site users insider China continued to encounter an error message: "Network Timeout. The server at youtube.com is taking too long to respond." "We do not know the reason for the blockage and we are working as quickly as possible to restore access to our users," said Scott Rubin, a spokesman for Google, which owns YouTube. At the time, protesters burned vehicles and shops, some advocating independence from China, and others demonstrating against the growing influence of the Han Chinese in the area. Many in the country speculated the latest ban may be an attempt to filter access to footage that a Tibetan exile group released. The videos show Tibetans being kicked and beaten, allegedly by Chinese police officers after the riots. "Though there is much footage of the protests taking place throughout Tibet last year that were splashed across the world, the following is rare footage of police beating of protesters, the suffering and death of a captive, and paramilitary presence in Lhasa (the Tibetan capital), which managed to make its way to the outside world," the Tibetan government-in-exile in Dharamsala, India, said of the videos. Xinhua, China's state news agency, accused the supporters of Tibet's spiritual leader, the Dalai Lama, of doctoring the video to "deceive the international community." China, with 298 million Internet users, has routinely blocked access to Web sites it considers politically unacceptable, including the Voice of America and The New York Times. The Chinese government has also censored television broadcasts, including those by the BBC and CNN, during coverage of issues such as its policy in Tibet and Taiwan. The Chinese government did not directly address whether it has blocked YouTube. "China is not afraid of the Internet," said Foreign Ministry spokesman Qin Gang on Tuesday. "We manage the Internet according to law ... to prevent the spread of harmful information." YouTube, which allows users to upload and share videos, has been banned periodically in other countries as well. Bangladesh, Pakistan, Thailand and Turkey temporarily shut off access to the site after users uploaded content the countries' governments considered politically embarrassing.